Hello... You've found Children's Party Entertainer and Magician Andy's Magic your local, and one of the best kids party entertainers, in Worcester and Worcestershire. 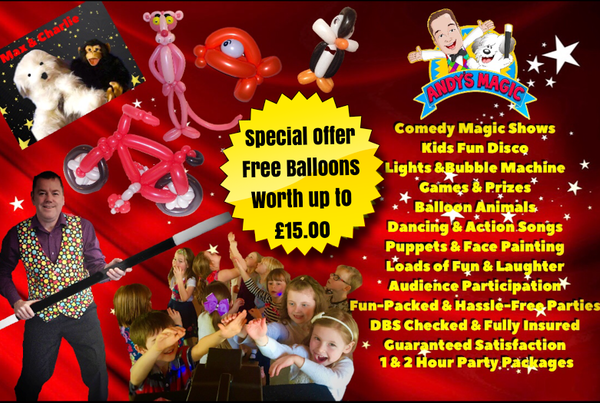 Offering Parties that are full of fun, laughter, amazing magic shows and he'll leave you with some great magic memories too. Invite Andy, children's magician, and he'll also include his to loveable puppets Max the Magic Dog and Charlie the Monkey. Whether it's a birthday party, wedding, christening or a Christmas party - Andy's Magic Party Magician and entertainer from Worcester guarantees satisfaction.